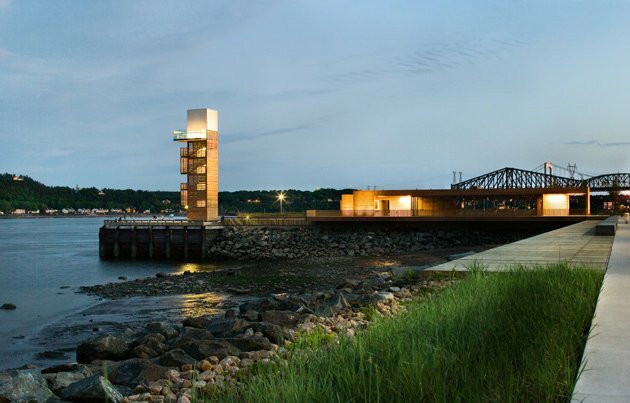 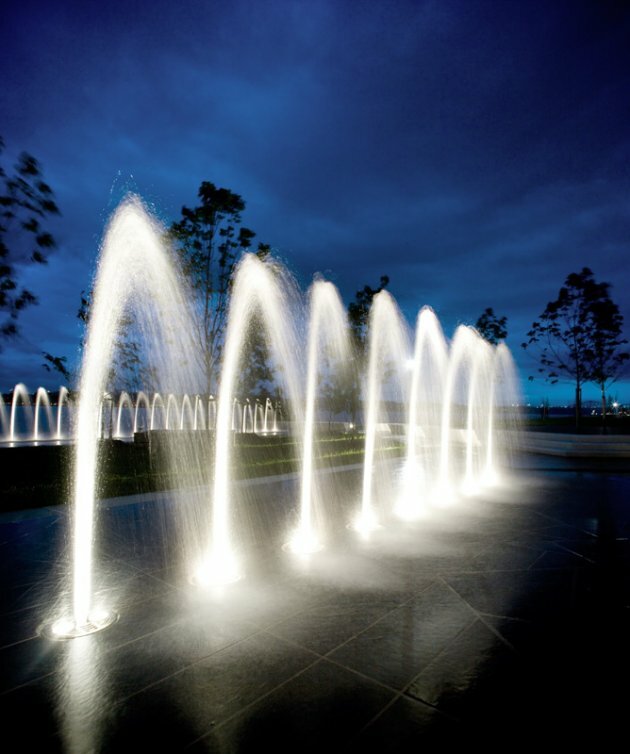 The project location into the Promenade makes it an important entry to the site and revives the imaginary of a river pier and of its intrinsic structures, turning it into a local visual anchor and light beacon – a significant newcomer to the constellation of industrial relics dominating local landscape silhouette and vistas. 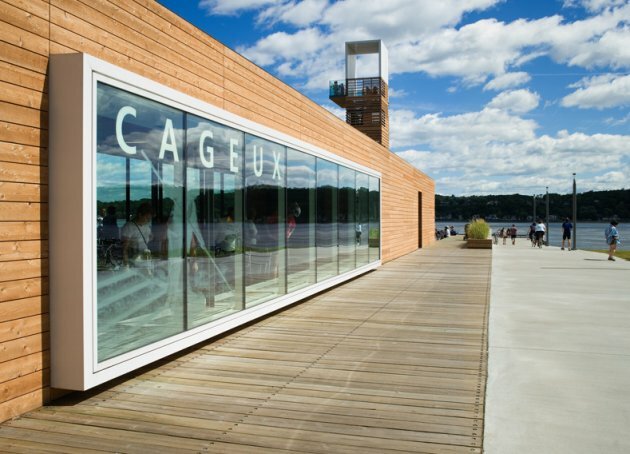 Quai des Cageux Visitor Centre is the western entry of the park, but is also the arrival of the pedestrian and cycle path coming from the other end. 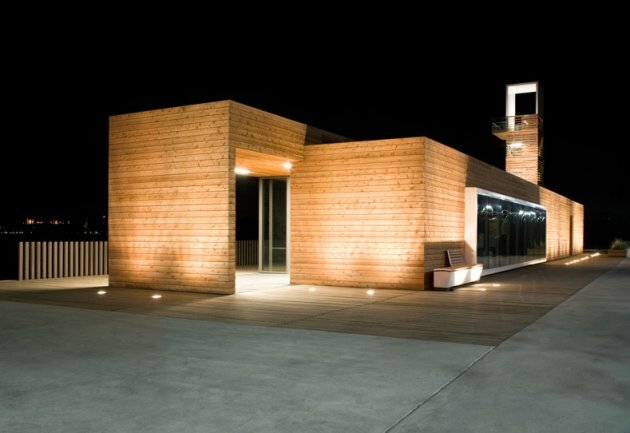 It is structured by a singular belvedere, a multifunctional pavilion and a deck, all three elements associated in the wide landscape by geometric associations. 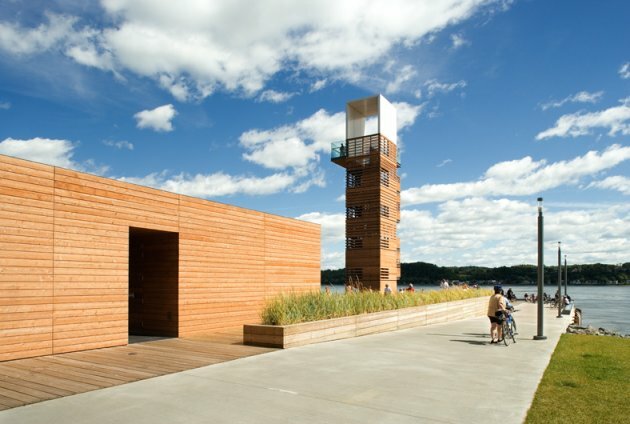 Playing horizontality versus verticality, emptiness versus fullness, the public timber deck space is articulated by alow visitor pavilion and a high observation tower. 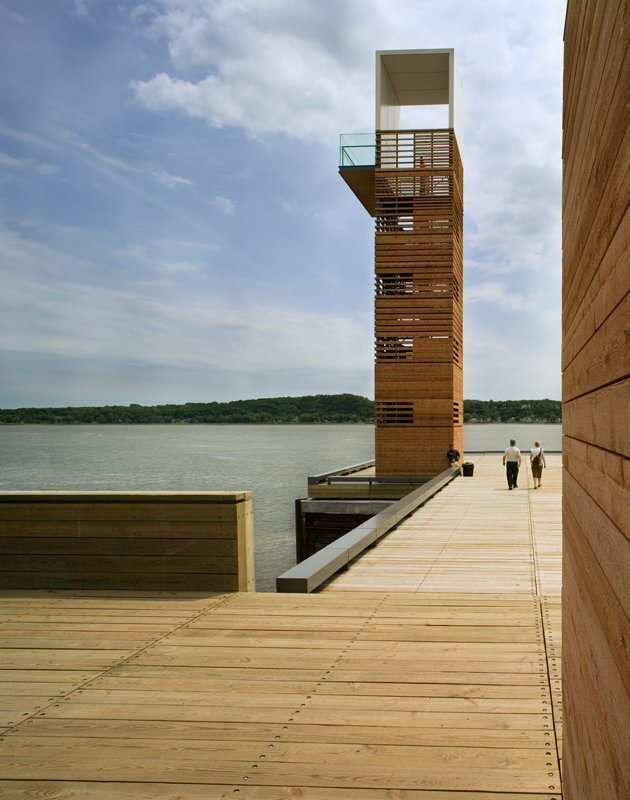 Clad in wood –same material inside and the outside the building – the Pavillon is an assembly of a generous multifunctional hall with a carefully orchestrated set of covered outdoor spaces, all directly overlooking the river. 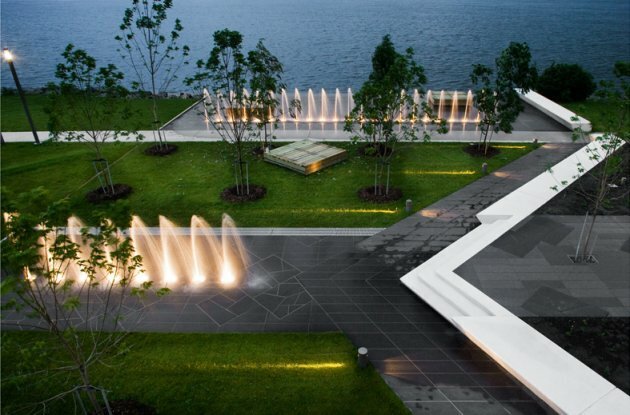 Seamlessly extending outward onto the belvedere’s open areas, the centre’s 250 m2 are to accommodate a variety of exhibits, events and seasonal festivities related to the overall Samuel-De Champlain linear park. 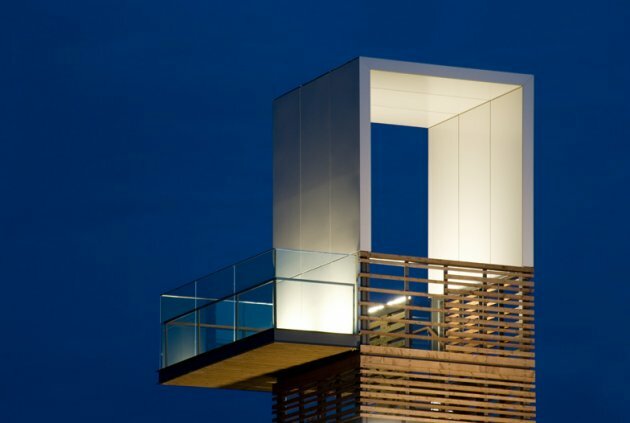 The tender silence of the pavilion’s bold wood volumes is balanced with the transparency and permeability of its glazed main hall. 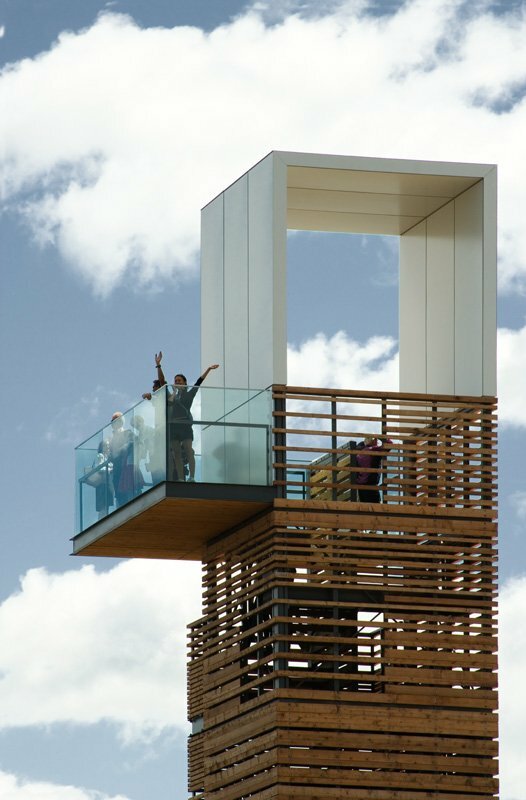 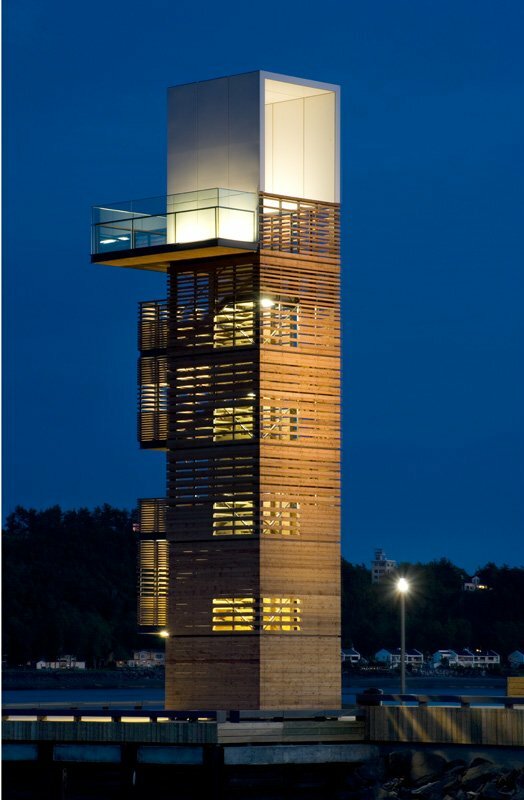 Sitting on the belvedere’s river edge to the south, the observation tower brings visitors 25 metres above the river, creating a stunning panoramic window onto the river, the bridges and the new linear park. 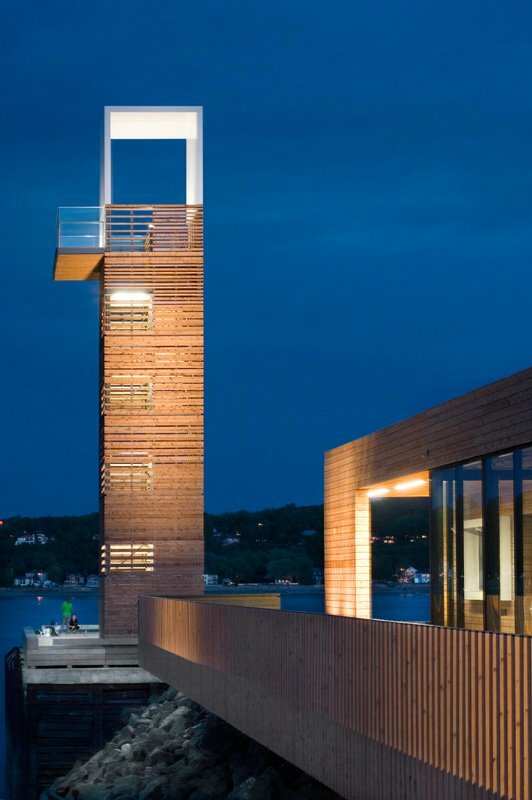 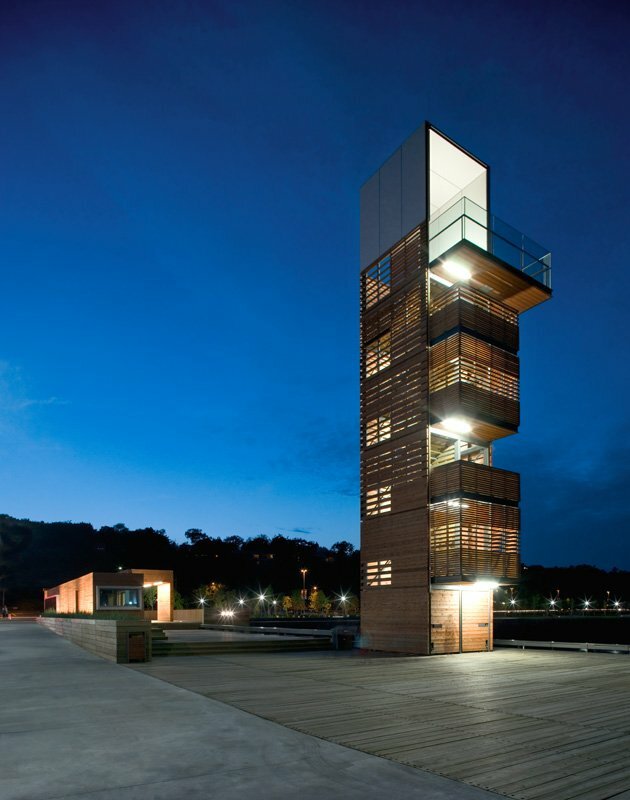 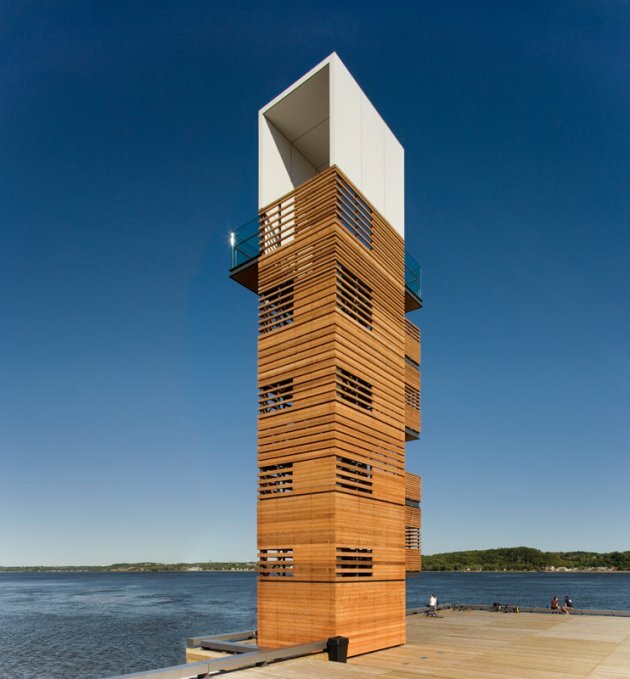 The tower, with its steel structure and latticed timber flanks, refers both to historic pier towers and to the lumber pilings characteristic of the 19th century port lumberyards. 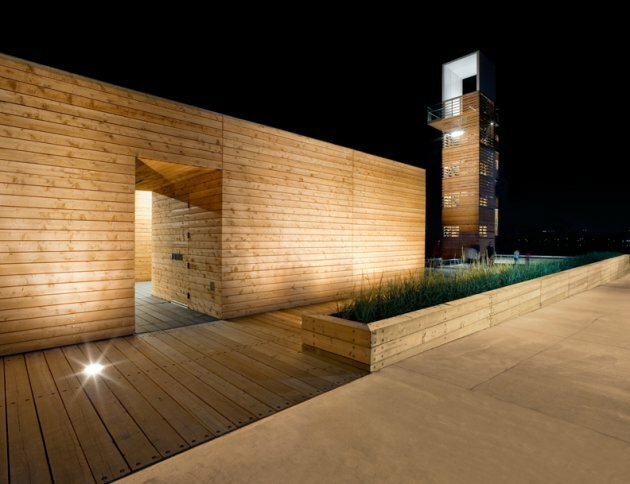 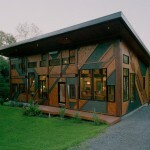 The architectural language is inspired by the character of the site and by the 19th century memory of lumber exploitation and shipbuilding. 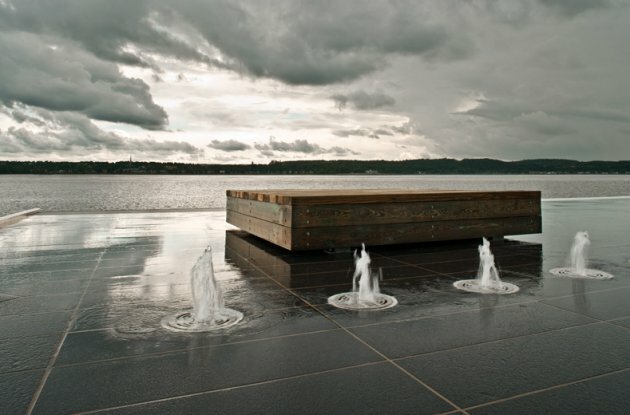 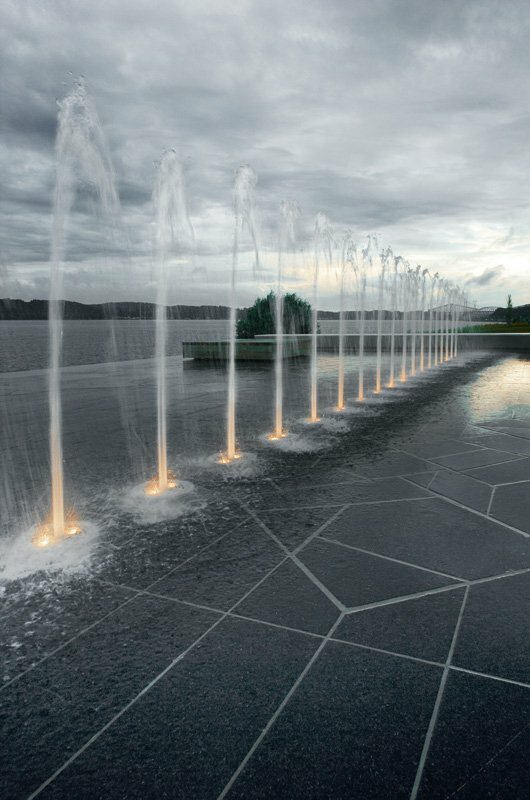 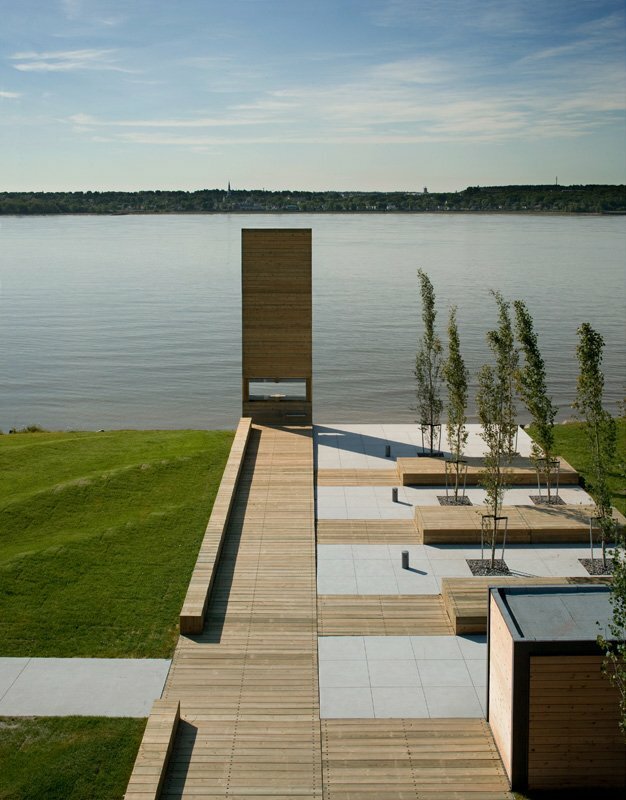 Deeply anchored into Quebec’s collective memory, the story of this important period, decisive in the evolution and transformation of coastal landscape, inspires the morphology of this restoration project. 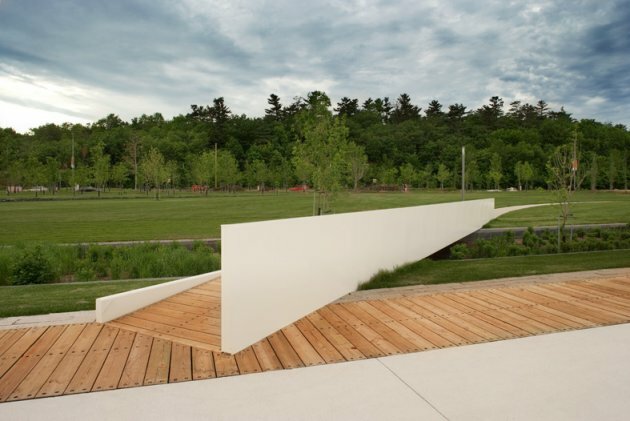 While borrowing its substance from the history of Quebec’s early modern times, it is precisely from the straightforward modernity of these audacious industrial endeavors that the project draws the simplicity and strength of its expression. 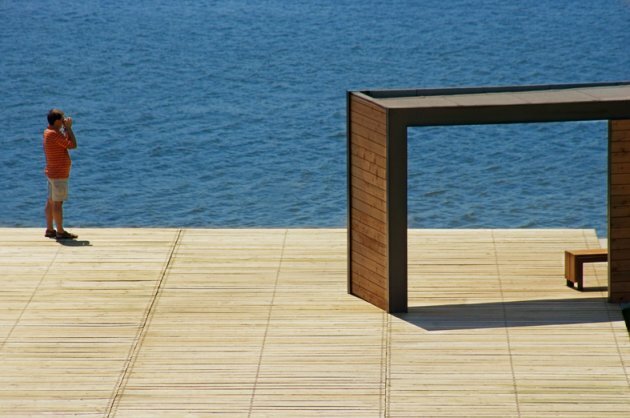 This singular expression is carried into a noble material – wood. 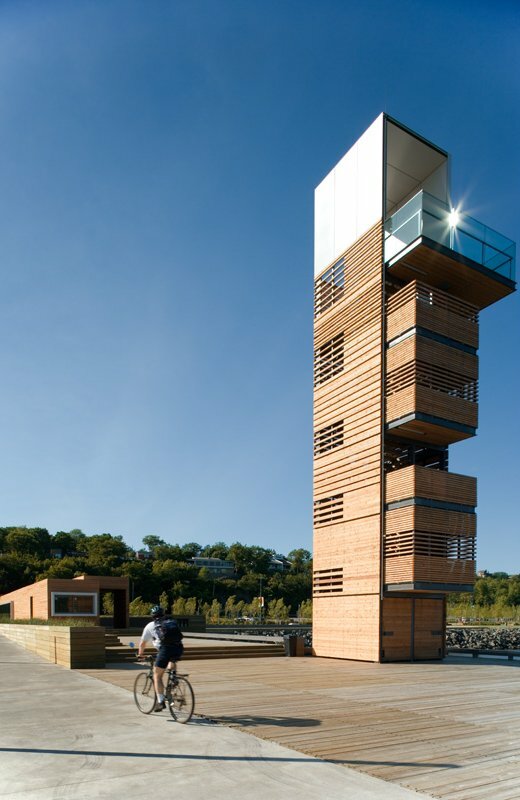 In its materiality and morphology, the project refers to both the harbor vernacular, and to the lumber pilings that characterised Quebec’s ports for decades. 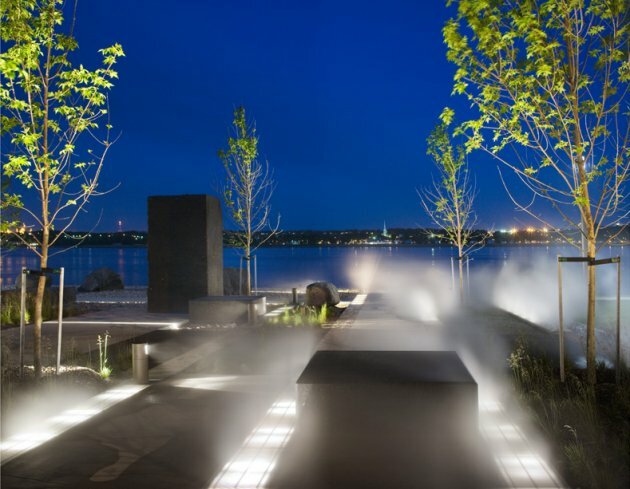 Respectfully remaining within the historic Quai Irving footprint, the project merges into the shoreline promenade and extends further northward to Champlain Boulevard, creating the western entry to the linear park project. 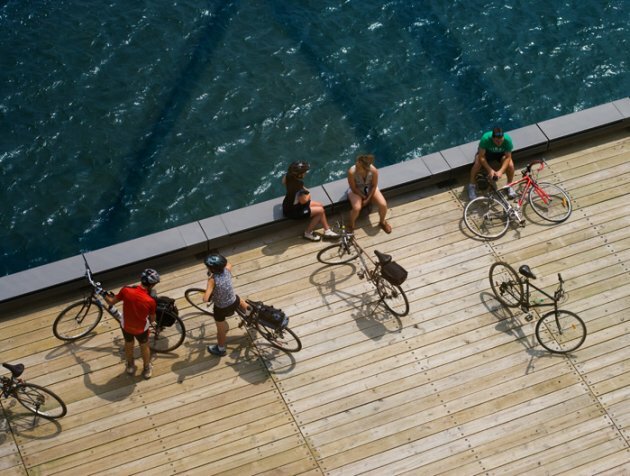 The rehabilitated timber deck of the quay is a generous public gathering place throughout the year. 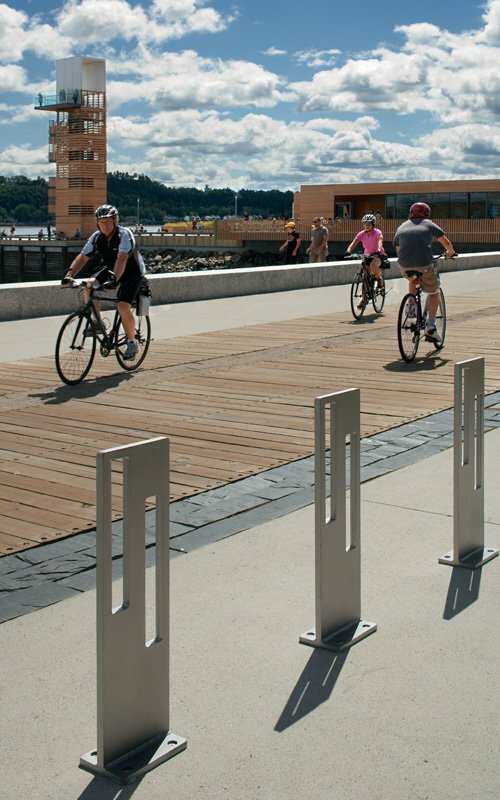 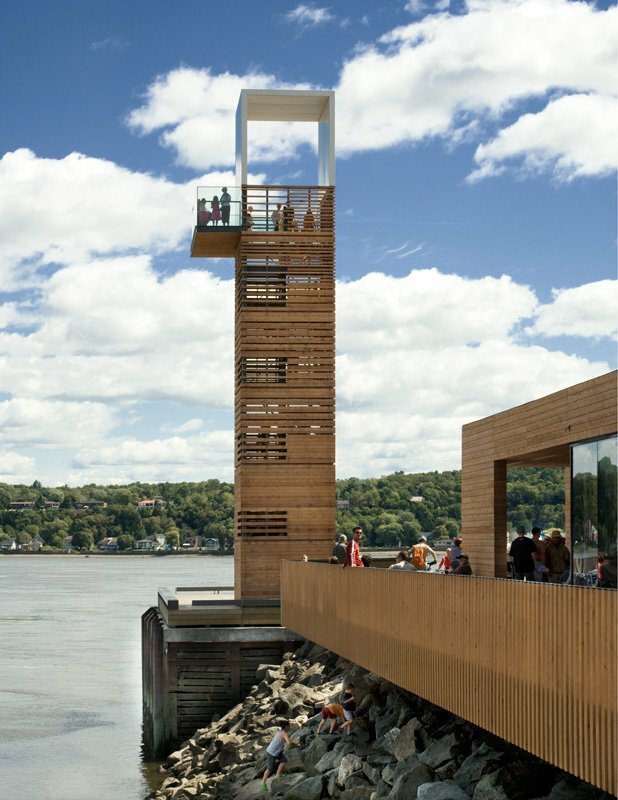 Defined and shielded to the south-west by a planted wind-screen, the Quai des Cageux may become one of the stops of Quebec’s cross-river shuttle-boat, connecting bicycle networks on both sides of the river and further activating this belvedere space. 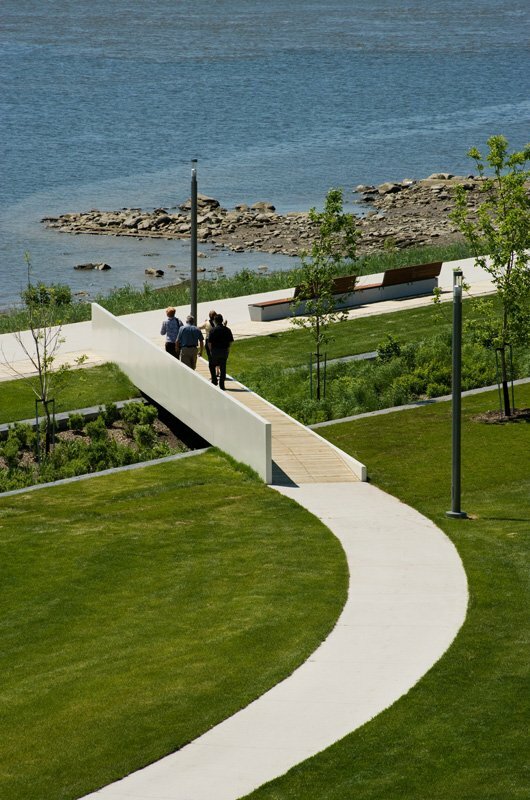 With its services of interpretation and restoration, and its attractive architecture, the project strongly contributes to revitalise the Lawrence River’s borders and brings important wellness and economics repercussions to the city and the surroundings. 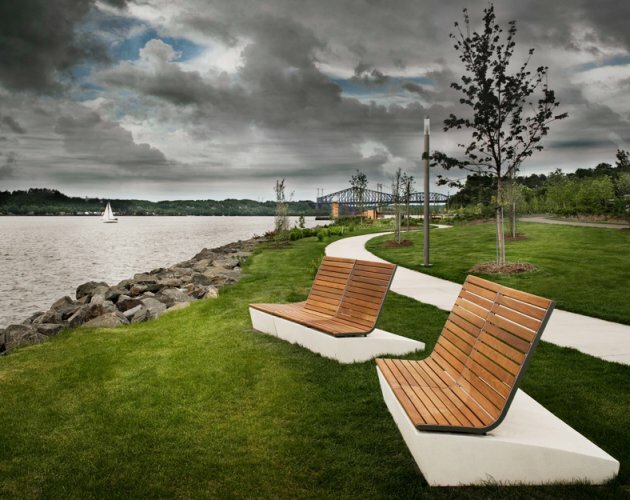 Quai des Cageux area exists because designers choose to remove a section of the highway and place it further away. 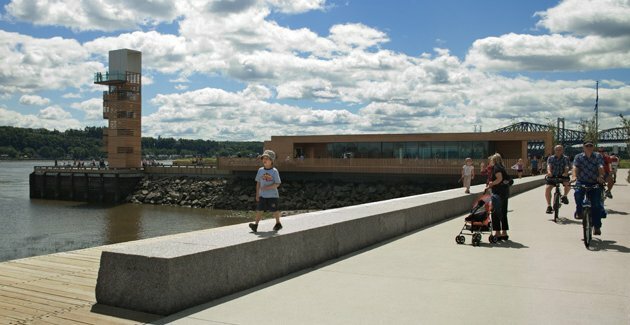 The project transforms this part of the shoreline into a new inviting and user-friendly environment oriented towards the water and very accessible. 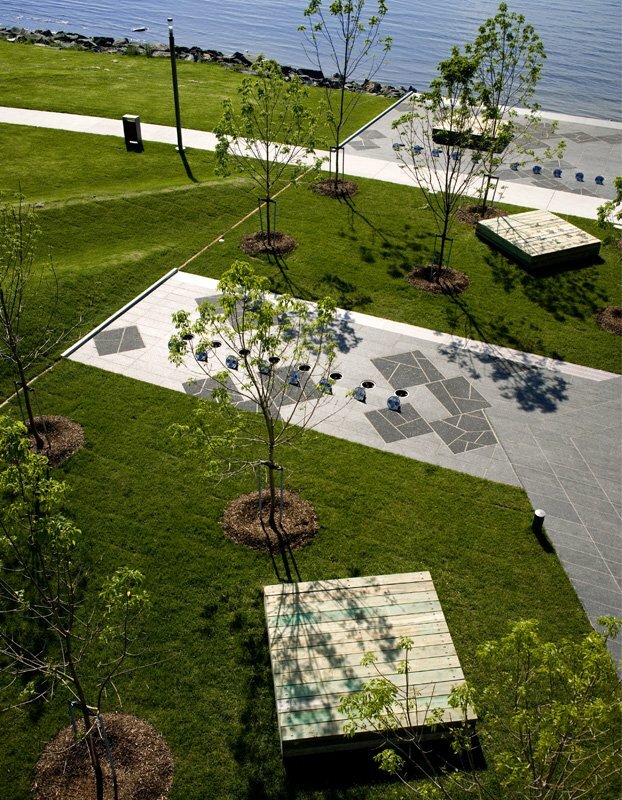 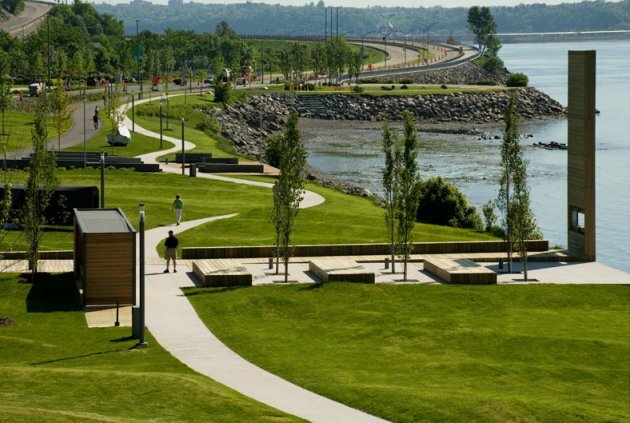 As the Promenade project qualifies Champlain Boulevard from a highway into a landscaped, permeable urban boulevard, it is easy for users to leave their cars and walk to the visitor center, or to arrive by foot, bicycle, boat and any other transportation way. 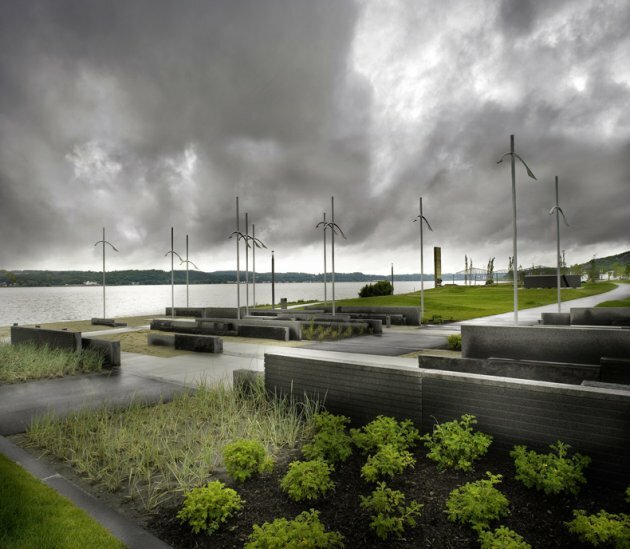 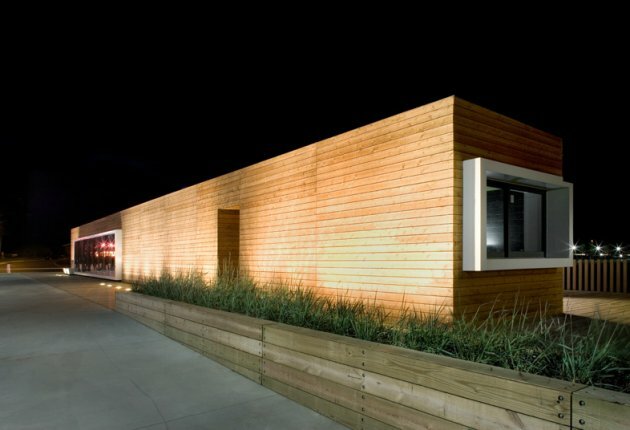 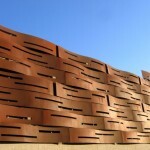 Quai des Cageux Visitor Centre uses geothermic energy as well as long last materials.